Oberheim OB-1 synthesizer advertisement from page 11 of Contemporary Keyboard November/December 1977. This Oberheim advertisement introducing the OB-1 synthesizer ran intermittently in CK for around six months starting in November 1977 until April 1978. Interestingly, the OB-1 didn't appear in the Spec Section of CK until August 1978 - four months after this ad stopped running. I really really really enjoy this advertisement. I like so much about it that I feel kind of like a prick for commenting first on the one thing lacking. The first thing I noticed about this advertisement was that my eye couldn't quickly and easily identify the synthesizer being advertised. Usually the name of the synthesizer will be found at the top of the ad in big letters, in the tagline, or prominently displayed as part of the photo or imagery. For example, Moog would often included the name of the synthesizer at the top of the ad or at the bottom of the ad. ARP was more likely to add it to the tag line or have it noticable in the photo. I think Sequential Circuits did it best when incorporating the name into the imagery of their awesome Ear-Force advertisements. I'm not saying this was always the case, but it was a good rule to live by. 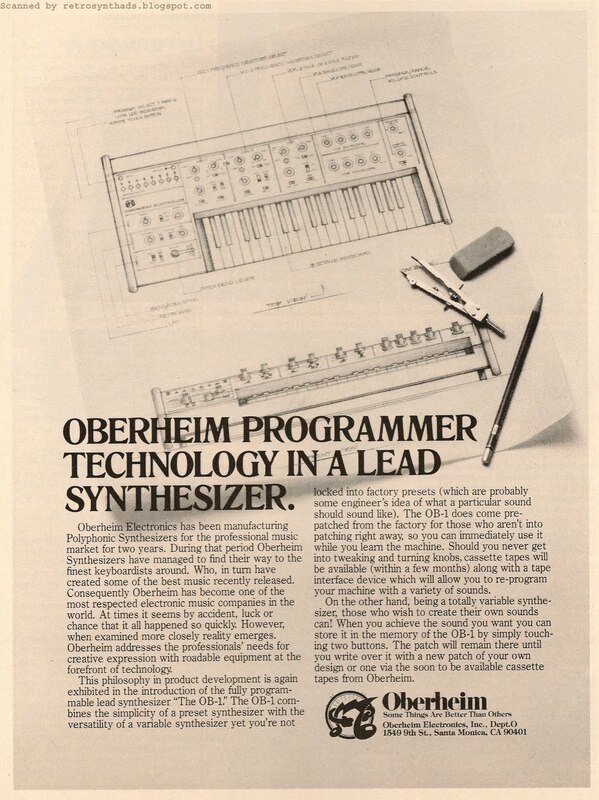 Looking now at this OB-1 advertisement, you can see that Oberheim doesn't even mention the name of the synthesizer until halfway through the ad-copy. 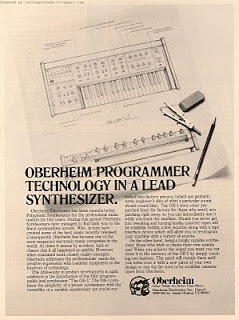 Maybe because it was an introductory ad, Oberheim thought that showing the outline diagram of the synth would draw reader's curiosity in more than the name of a synthesizer no one had heard of yet. 1. The bass. It was *really fat*. F-A-T. FAT. 2. The memory select buttons. They were actually these metal dome-shaped touch-sensitive contact-type things. They were very unique and I remember that I had never come across anything like them before. While researching this post I was quite surprised at how long it took me to find someone else mention this unique feature. I finally found this post on MATRIXSYNTH that has a great photo of the touch contacts and also includes a comment describing how to store patches. 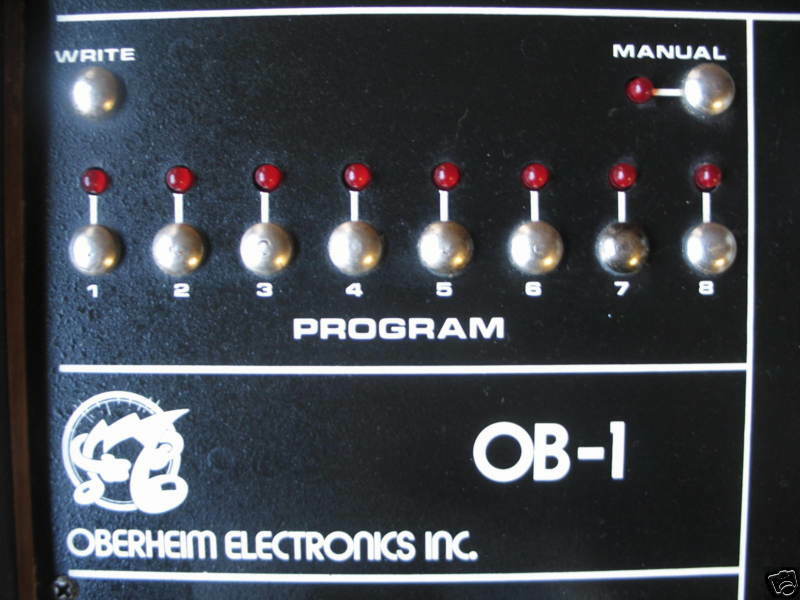 The OB-1 has the distinction of being known as the first commercial programmable synthesizer and it's architecture is based around the SEM module. 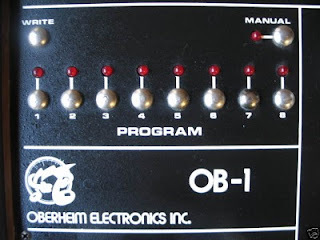 You can find some more reference information on the OB-1 at Vintage Synth Explorer and everything2.com. Looking at photos on Sequencer.de, it seemed to have come in two models (didn't know!) - a gray face panel and a black one. But I can't find much information about the differences between these two models besides the colour. a) Love the image and the layout. It's timeless - I had to double-check the date.